The Winter Park Health Foundation’s staff are working together, and with other organizations, to inspire healthy communities. Below are a few quick updates to some of the projects that they have been working on this past month. Debbie Watson, WPHF Vice President, far right, served on the ELCOC panel with, from left, Kevin Carnes, President of the Educational Division at Lakeshore Learning Materials; Michael Frazier, a Licensed Professional Counselor, and Ana Leon, a UCF professor and licensed social worker. Debbie Watson, Winter Park Health Foundation (WPHF) Vice President, served as a panelist at the Early Learning Coalition of Orange County’s fourth annual State of Early Care and Education Forum on February 26 in Orlando. 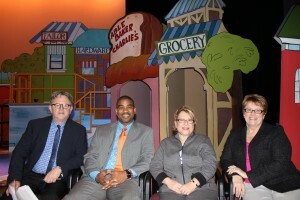 Panelists discussed a variety of issues related to the social and emotional health of children. The event is designed to spark a healthy dialogue between early child care and education advocates and community and business leaders. The UCF College of Health and Public Affairs hosted a February 27 presentation by Dr. Richard Jackson, Professor and Chair of Environmental Health Science at the UCLA Fielding School of Public Health in Los Angeles, CA, called “Planning Healthy Communities” with support from a $2,000 Winter Park Health Foundation (WPHF) grant. Lisa Portelli, WPHF Program Director, served as a panelist for the event held at Florida Hospital. Dr. Jackson and Ms. Portelli also spoke at the Urban Land Institute (ULI) of Central Florida’s kick-off event for its “Building Healthy Places Initiative” on February 28th in Orlando. The ULI brought leaders together to discuss the link between healthy environments and land use.